The 12th annual English Music Festival, running from 25 – 28 May 2018, will commemorate the centenary of the end of the first world war and pay homage to composer and suffragette Ethel Smyth in celebration of the 100th anniversary of the Representation of the People Act. 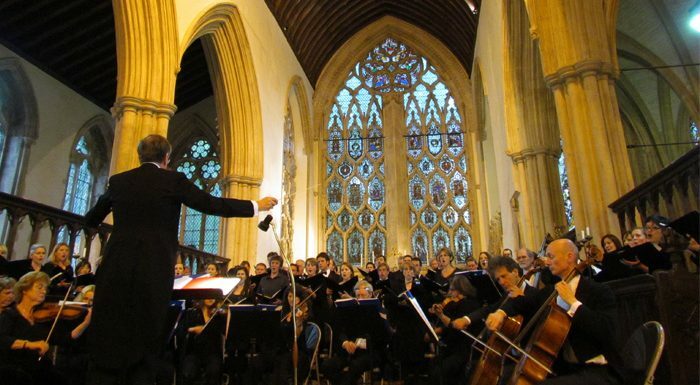 The English Symphony Orchestra under conductor John Andrews will open the festival at Dorchester Abbey with premieres of works by two British composers: Christopher Wright’s Symphony and Richard Blackford’s Violin Concerto with soloist Rupert Marshall-Luck. Completing the programme will be a rare performance of Delius’s Double Concerto for Violin and Cello from Rupert and cellist Joseph Spooner. Baritone Roderick Williams will commemorate the end of the first world war, together with the Bridge Quartet and pianist Michael Dussek, with a programme featuring Ivor Gurney’s song cycle, Elgar’s Piano Quintet and Howells’s Phantasy Quartet. Actor Christopher Kent and pianist Gamal Khamis will juxtapose readings of war poetry by Wilfred Owen, Edward Thomas and Siegfried Sassoon with music by Elgar, Bridge and Gurney for a recital entitled ‘Never Such Innocence’. A real highlight of the festival will be ‘Grasp the Nettle’, an all-female concert dedicated to the composer, writer and suffragette Dame Ethel Smyth. Contralto Lucy Stevens and pianist Elizabeth Marcus will explore some of Smyth’s greatest works, with music from her opera The Wreckers, the Mass in D, the overture from The Boatswain’s Mate, and The March of the Women. Owain Arwel Hughes will conduct Camerata Wales in a concert of British string music, including his own Fantasia in A minor, Dyson’s Woodland Suite for string orchestra, and Warlock’s Serenade for the 60th birthday of Delius. More English favourites appear courtesy of the Holst Orchestra and Godwine Choir, as well as a piano recital of works by Alwyn, Sterndale Bennett, Parry, Bliss and York Bowen from Richard Deering. Complimenting the music will be a programme of pre-concert talks including a voyage through Sir Hubert Parry’s works for violin and piano, the impact of the first world war on Gustav Holst, Bliss’s music of the 1920s and 1930s, and a composer’s perspective of the two premieres from Richard Blackford and Christopher Wright.